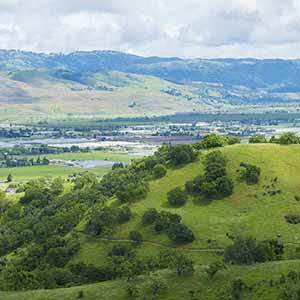 Located in the high hills above suburban Almaden Valley, Almaden Quicksilver is a very scenic park with a nice blend of oak woodland and open meadows. The northern part of the park has a suburban feel, while the southern part is more rugged and a little more remote. 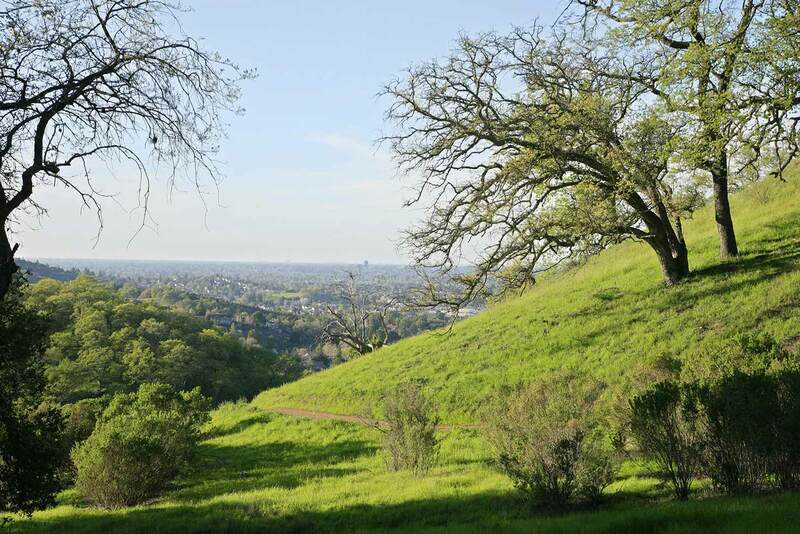 Even more than other local parks, Almaden Quicksilver is at its best in the spring, when its grassy meadows are green and the oaks are just leafing out. In summer, the park seems a bit parched and the long, steep grades in the southern part of the park get very hot. The park is very popular, especially the McAbee Road trailhead; on nice weekends the suburban roads around the trailhead are lined with cars, and near the entrance you might encounter three or four groups of people per minute. Most people don’t go far into the park, though; the short Senador–Guadalupe and Guadalupe–Mine Hill loops are the most popular. The trails further into the park, which are actually much more scenic, are mostly used by joggers and mountain bikers. A few remnants of mercury mining facilities are scattered throughout the park. There isn’t actually a whole lot to see, but the most interesting spot is the San Cristobal Mine, a tunnel that visitors can walk a few yards into. 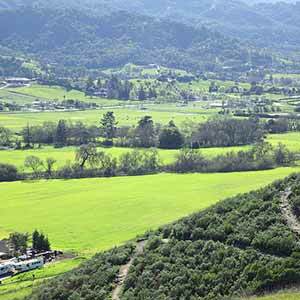 The recommended route starts with a pleasant stroll through attractive woods, then returns on an open, ridgetop dirt road with striking panoramic vistas of the green Santa Cruz Mountains and the South Bay suburbs. The different kinds of scenery make for a varied and enjoyable hike. This loop in the northern part of the park includes one of the park’s few singletrack trails and a long, easy descent with nice views on the Mine Hill Trail. Start at the McAbee Road trailhead. Turn left onto the Mine Hill Trail, which climbs past attractive meadows. At the next intersection, turn left onto the singletrack New Almaden Trail. 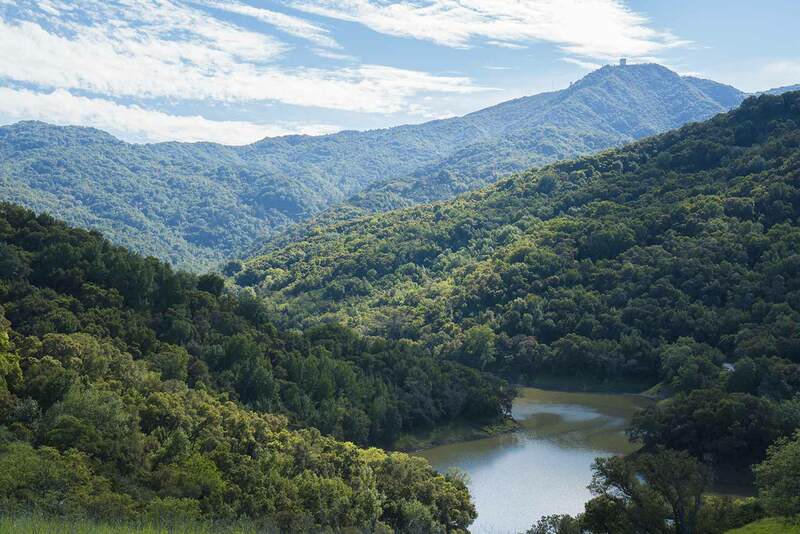 The New Almaden Trail is an especially enjoyable woodland walk. The crowds drop away, as most visitors prefer to stick to the wide dirt roads. The trail dives into ravines deeply shaded by a dense bay laurel canopy and emerges into open fields with very nice views of rolling green hills and suburbs. It also passes through a few exceptionally attractive, open groves of blue oaks with a grassy lawn. From time to time traffic noise drifts up from the valley. Although the trail looks roughly level on the elevation profile, it actually has a lot of up-and-down that can be tiring. 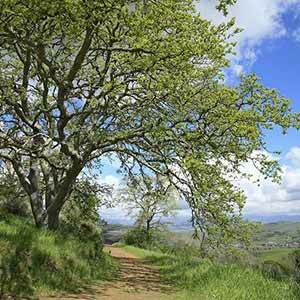 In addition, the trail can be narrow and there’s a lot of poison oak overhanging the trail. As an alternative, an unofficial trail lets you cut over to the much easier Randol Trail, which is a wide and level but less interesting dirt road. The Webb Canyon Trail seen from its intersection with the New Almaden Trail. Campbell’s distinctive Pruneyard Tower is visible on the horizon. 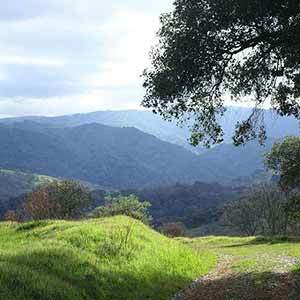 Turn right at the Prospect #3 Trail, which climbs steeply through chaparral to the Randol Trail. Cross the Randol Trail and continue on the Prospect #3 trail, which climbs at a more moderate grade and switchbacks up to the Mine Hill Trail. The trail gets a little narrow and overgrown, with a bit of poison oak encroaching onto it. 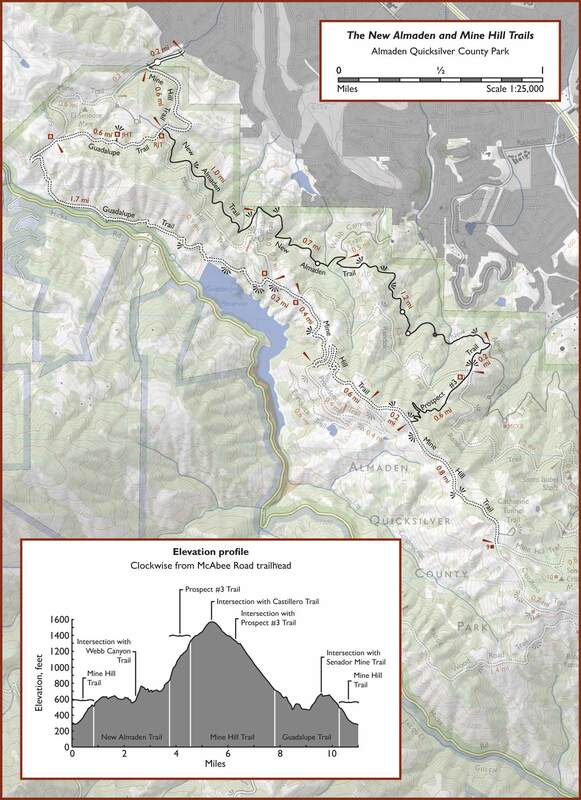 For an optional side trip, turn left on the Mine Hill Trail and climb 0.8 mile to the intersection with the Castillero Ttrail, near the crest of the Mine Hill Trail. The outbound walk isn’t anything special, but the return trip has some of the best views in the park. At the intersection, there are a few picnic benches under some trees with a nice view of Mount Umunhum, a nice spot to have lunch. When you’re done, walk back down the Mine Hill Trail. If you’re skipping the side trip, just turn right on the Mine Hill Trail, cutting 1.6 miles and 230 feet of climbing from the hike. 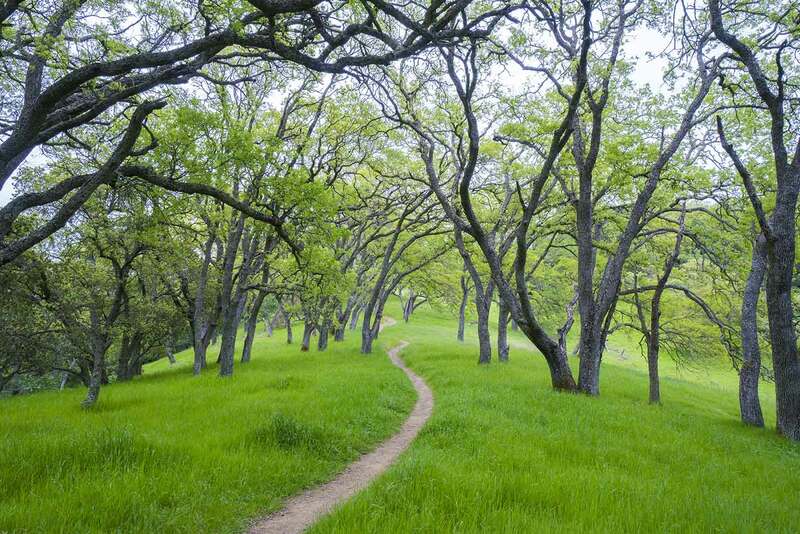 The Mine Hill Trail descends through grassy meadows dotted with oaks. 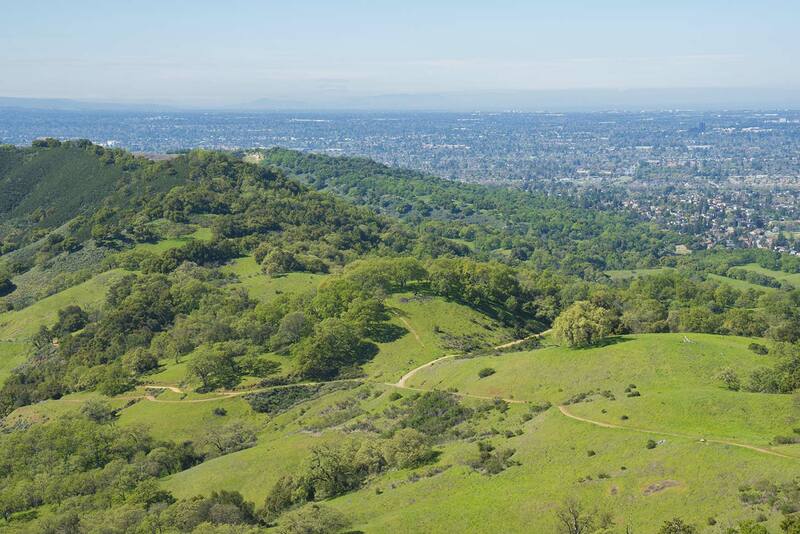 The trail has really nice views of the Almaden Valley and the vast Santa Clara Valley, as well as the impressively green Sierra Azul Mountains, crowned by Mount Umunhum with its distinctive cube-shaped pillbox. At the bottom of the hill there’s a nice view of the Guadalupe Reservoir, winding into the green hills. The trail reaches a saddle and the intersection with the Guadalupe Trail. 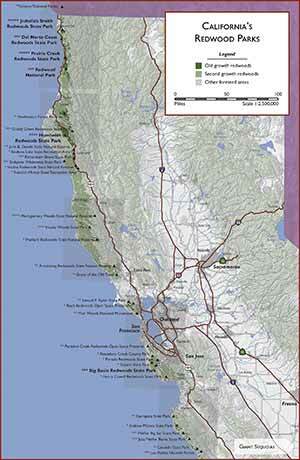 The route shown on the map takes the Guadalupe Trail, which descends past the Guadalupe Reservoir dam and passes through some oak-lined meadows. 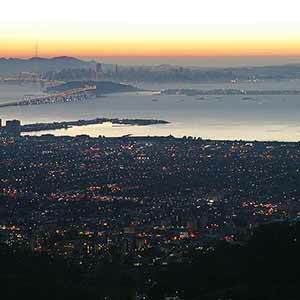 This route isn’t especially enjoyable at first, mainly because of traffic noise from a nearby road, but it improves a lot after climbing to a low ridge with views of the imposing hills and the Bay Area. For a shorter trip take the Mine Hill Trail, which descends through an open oak wood; this easier route cuts 1.4 miles and 270 feet of climbing from the hike.